Waiheke is the second largest island in the Hauraki Gulf, approximately 17 kilometres east of Auckland, New Zealand. The island was voted 5th in ‘the best regions to visit in 2016’ by travel guide ‘Lonely Planet’ and it’s easy to see why. It boasts picturesque beaches, top quality vineyards and a prominent arts scene, making it the perfect destination for a relaxing getaway. Known locally as the ‘island of wine’, Waiheke’s pleasant climate and ancient soil structures have helped produce some of the world’s finest reds and whites, so be sure to organise a tour of the island’s most famous vineyard, Stonyridge. Of all the superb white beaches, Oneroa and Onetangi on the north coast top the list. Their vast stretches of immaculate sand make an ideal setting for picnics, while the waters are perfectly safe for children to swim in. Lying next to Oneroa Bay is the fascinating Artworks Complex which houses a community theatre, art-house cinema and a gallery showcasing local art pieces. For an insight into the Waiheke’s past, head over to the Stony Batter Historic Reserve towards the east. It features tunnels and gun emplacements that were used to defend Auckland Harbour during World War II. There is plenty to keep the thrill seeker occupied, too. The state-of-the-art triple zip line called ‘the flying fox’ offers unbeatable views across the island whilst giving you a huge adrenaline rush. You can also rent kayaks to explore the coastline and its countless coves, so there’s plenty to do on this beautiful island. 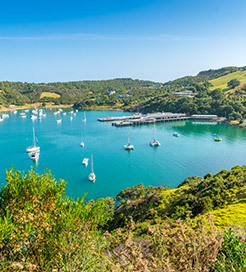 Waiheke Island is within easy reach from Auckland, with frequent sailings provided all day from the main harbour and slightly less frequent crossings from Devonport on the North Shore. For more information, please visit our Ferries from New Zealand to Waiheke Island page.